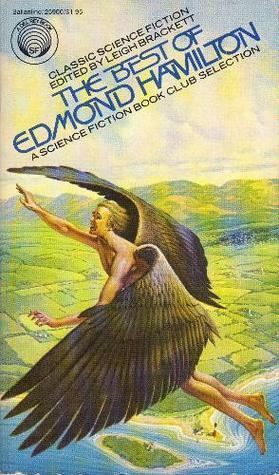 If you’re a science fiction fan, especially with a taste for older works, you’ll enjoy reading Edmond Hamilton (1904 – 1977). I got my feet wet with his “Captain Future” stories, followed by the “Star Kings” and “Starwolf” series. If you’re new to Hamilton’s works this “best of” collection is a good place to start. Leigh Brackett, the editor of the collection, and Hamilton’s wife, had a big job, choosing but a few of his many stories for the anthology. As I read previous reviews of this book, I see many comments about the writing credentials of both Brackett and Hamilton, Hamilton’s impressive span of work, and his famous nickname of “worldwrecker.” All true and valid points. But, as both a reader and a writer myself, I’d like to address something else about these stories – their enduring power. We are, today, much more sophisticated in technological speak. As Hamilton himself says in the afterword, by the 1970’s it was no longer as easy to “fudge” your sci-fi tech-speak. And today, it’s even more true. Science fiction during the pulp era spoke to readers of the time and a common complaint of modern readers is that the stories sound frustratingly old-fashioned. No wonder! They were written long before men got to the moon! I’m rarely bothered by those old visions of future tech. When I read a pulp story, I’m looking for far more than technological speculation. I’m looking for the story’s heart. And what is that? I’d call it the romance of the story, not in the sense of romantic love, but in a sweeping tale that carries you into the vision of the writer, speeds you through, then drops you on the other side, changed. Hamilton is good at that. Feelings linger after reading his stories – some creepy, some sad, and some stunning in their profundity. “Exile” was my favorite in the collection and left me thoughtful. “He That Hath Wings” and “Child Of The Winds” made me sad. “Day Of Judgment” was a big, powerful story, and again, left me thoughtful. “Fessenden’s Worlds” made me mad, as it was supposed to. After reading “Castaway,” I wondered aloud if a writer today could get away with using Edgar Allen Poe as a main character. Somehow I doubt it, although the treat worked well in Hamilton’s capable hands. In “The Pro” you hear Hamilton speaking to readers as a version of himself. It’s a revealing glimpse into his feelings about writing. That story was published on the month and year of my birth. Funny to see that bit of trivia in the records. It made the story feel like a birthday present to me, one I discovered just yesterday. Awfully “timey-wimey,” I know. But how perfect for a well-written science fiction story from one of the best.